Product categories of Stamped Knife, we are specialized manufacturers from China, Stamped Knife, 5 inch Stamped Knife suppliers/factory, wholesale high-quality products of Stamped Steak Knife R & D and manufacturing, we have the perfect after-sales service and technical support. Look forward to your cooperation! Stamped Knife make from High quality stainless steel , It is very hard,only secondly to the diamond, supper sharp and longer life than the traditional steel knife,with no need of sharpening for years. Rust proof ,non-adhesion,very easy to clean.No chemical reaction with the food,food grade raw material.Anti-corrasion, never rust ,keep the food original color and flavour ,environment friendly.The cutting edge of the tool design is suitable for meat, fish, vegetables and other raw and cooked food slices, cut, cut silk.From the initial selection to each stage of the production process, high quality standards are followed to ensure high quality.Specially formulated steel, cutting-edge process technology makes Zwilling tools have both long-term sharpness and corrosion resistance.Allows you to cut neat, smooth knife, fully enjoy the joy of cooking and efficient.The use of sophisticated production technology makes the blade-to-handle assembly smooth, seamless, and comfortable to hold, making it difficult to collect filth and clean.We can provide many kinds of kitchen knife sets like 4pcs Stamped Steak knives set which are top quality. 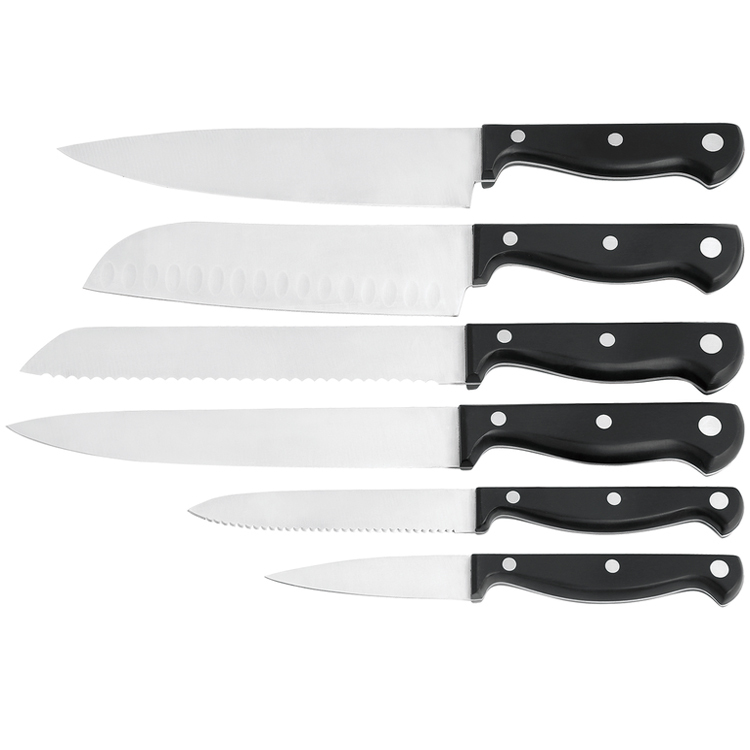 We can also make single knife like 8in stamped chef knife, 7in stamped Santoku knife , 5in Stamped utility knife , 3.5in Stamed parer knife .You can choose what you like. And we can develope together with you according to your new concept ! .